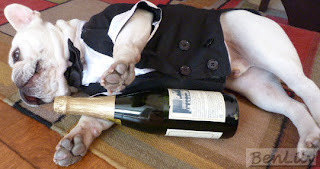 Looks like you had a great pawty!! You two are so cute. Happy New Year! Oh my!! Looks like you guys had way to much fun last night. We just stayed home and tried to sleep with all those fireworks going off all night. it was scarey. Just red about the poor little seal pup. So sad. Happy New Years my friend. I hope you don't have a head ache! Take it easy guys ! Best wishes of joy, health, love and happiness for 2012 !